I'm an iced coffee fiend. Last summer, The New York Times wrote about making cold-brewed iced coffee, so I gave it a whirl. I tried it and I wasn't impressed. I realized what was wrong was the idea of creating a concentrate, so I tried again without diluting the precious brew. I loved it. It cut out the bitterness and made for a nice smooth icy beverage. So when a friend of mine recently raved about making a fridge-brewed iced tea, I decided that I had to try it. It too creates a much smoother tea than making it the old-fashioned way, plus you can say goodbye to the stove – a nice bonus during the hot summer. I've tried this method with plain old orange pekoe tea and it's delicious with a bit of fresh garden mint thrown on top or a squeeze of lemon. I don't add sugar or any kind of sweetener because I find it quite refreshing without...and I don't miss the extra calories, either. Try this fridge-brewed method with rooiboos, hibiscus or your favorite herbal or black tea and stay cool this summer. Want to stay extra cool? Use leftover tea (or coffee if making iced coffee) in your ice cube tray. Your drink stays icy cold without getting diluted and weak. 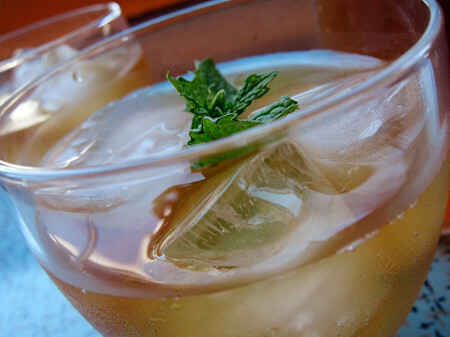 You could also freeze a sprig or two of fresh herbs in your ice cube tray to give your summer drinks an herbal kick. Drop tea bags into a glass pitcher and pour cold water over top. Let it sit for 12 hours (or longer) in the fridge. Remove tea bags. Serve in glasses filled with ice. Add fresh mint, lemon or stir in some simple syrup or agave syrup, if desired. Yay! 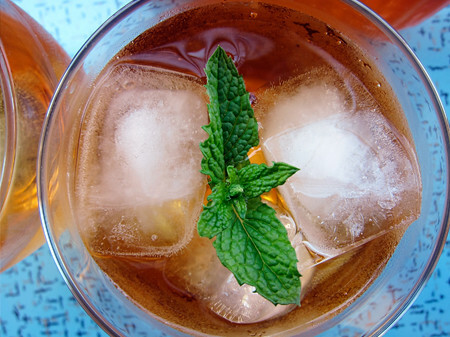 My mom used to make fridge iced mint tea all the time in the summer when I was a kid. Sometimes she'd make sun tea too by putting the tea bags in a glass pitcher with water, closing the lid & letting it steep in the sun on the porch... it was pretty & fun to watch steep! Wow, I never knew you could cold brew tea. I'm gonna try this today. Thanks for sharing. i didn't know you could cold brew tea either. fab! thanks. @bekkah That's a favorite in my house too! To change it up a little, we sometimes throw in freshly squeezed lemon and lime. So refreshing! Iced tea today is such a great idea! I'm gonna make some right now to go with the really warm *way too warm* weather we have in Quebec! Great suggestion- how long is it safe to keep in the fridge? I have heard that iced tea grows bacteria rather fast. Hayley, I've never had iced tea that has lasted longer than 3 days in the house. 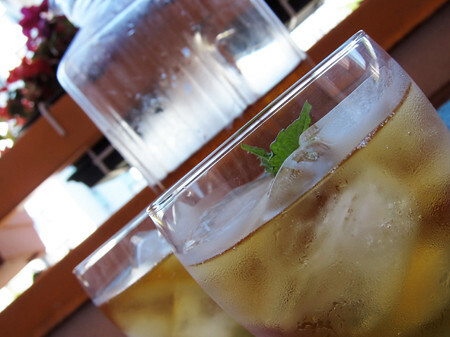 I know that sun tea can grow bacteria quickly, but fridge or traditionally brewed iced tea should last 3-4 days. This is exactly what I should have made this past week! I had been craving a refreshing glass of ice tea to quench my hot and humid body but did not want to turn on the burner. I was under the impression that the only way to make iced tea was to boil the water and throw in the tea bags! Duh! Thanks for enlightening me. The hubs and I go through a pitcher a day--more when we're making a concerted effort to cut down on alcoholic beverages. I have two giant pitchers and when one gets low, I hurry up and fill the other one so it's ready when we need it. I've found that with four good-quality bags of tea, I get a pretty nice steep in 3 or 4 hours. The economy-sized boxes of Lipton do take longer, though. Mosscow, I always keep my pitcher covered (mine has a lid), just to keep away other fridge odours.